Grover Norquist Interview on Immigration Reform - "People are an asset, not a liability"
The immigration reform bill, sponsored by U.S. Senator Marco Rubio (R-FL) has sparked a lot of discussion around the country bring about the kind of national debate we have needed for a very long time. Recently, Americans for Tax Reform founder, Grover Norquist, testified before the Senate about the pending legislation and why immigration reform is needed. He opened his testimony with the statement, "People are an asset, not a liability." Note: Join the discussion in the comments section at the bottom of this page. This week, Norquist sat down with TexasGOPVote to expand on his thoughts on immigration reform, and I asked him about this comment and what it means in the context of immigration reform. "The debate on immigration is about would more people, would more Americans, be a good idea or a bad idea," Norquist said. "What built this country, and it’s not just something people say to make us feel good about the Statue of Liberty, it’s that 70 million people came over from Europe and three quarters of them came to the United States, in all of the Americas, North and South, three quarter came here. Very distinctive people come to a land of opportunity, people who want opportunity, and when they showed up, they were poor, they were diseased, and they didn’t speak English. Within a generation or two they were just doing amazing things. So one of the questions you hear people ask is if people come here they’ll be a burden and not an asset. The labor unions believe more people coming into the United States will reduce wages. Well when we had three million people in the country, we were pretty poor. We have 300 million, 100 times as many people, and we are much richer. Why, because people are an asset. They are not a liability, Malthus was wrong, the zero population growth people are wrong." On the immigration reform plan from Sen. Rubio, Norquist said, "The plan says first of all we need to get control of the border. We have to have more security there. So they spend 4 or 5 billion dollars working on those areas, and one of them is to get some cell phone antennas, satellites, on the borders so that people in very rural areas can connect to the police. Someone got killed a number of years ago because they couldn’t connect to the police. The critics of Rubio’s bill ran out and said they were Obama folks that they were funding. Mocking the death of a rancher in order to score political points against securing the border suggests the lack of seriousness that we’re dealing with on the critics." Unlike the ObamaCare bill, this is not a bill we will have to pass in order to find out what is in it. It will be an open debate and discussion. As of this posting, there are over three hundred amendments being offered to the original bill. "I’m for amending the Gang of Eight’s bill, Rubio is for amending," Norquist explained. "We’re open to, first of all, border security, second of all, taking 10 or so million people who are here and allowing them earn legal status." Opponents to the bill, like talk radio hosts Rush Limbaugh and Mark Levin, throw the word amnesty around loosely. They use the word much like the left will throw around the word racist - in an attempt to intimidate legislators seeking reform or to get you to just shut up and not discuss it for fear of being labeled an amnesty supporter. Levin and Limbaugh are both fully aware of the definition of the word amnesty, but they count on the intimidation factor of the word. "Everyone is going to pay a fine if you stay," Norquist continued, "so calling it amnesty, someone who calls it amnesty hasn’t read the bill, they don’t know what they’re talking about, or they’re fibbing. I hear it from some of the professional anti-immigrant people, so you know they’re lying, they’re not ignorant of what’s going on, they’re just lying. They use it the way a 12 or 13-year-old uses a new swear word they just learned, because it gets such a rise out of everyone, but at some point you’re too old for that, and at some point it’s not funny anymore and you just turn it off." I asked Norquist about the "professional anti-immigrant" groups like FAIR, NumbersUSA and the Center for Immigration Studies who routinely slant their statistics to reflect their hidden leftist agenda of radical environmentalism and population restrictions. "Not only were they created by men and women of the left who are from the pro-abortion, zero population growth, radical environmentalist worldview," Norquist explained. "Their arguments today are still the same arguments, they don’t use conservative arguments, they take the labor union argument that more people mean wages go down, not that more stuff would be created. They take the radical environmentalist position that total numbers of people are bad things, that people are like pests, instead of created in the image of God, to create more things and people." "Each of these were set up as the other one got sort of outed for what it was. They set up some other group, but the control remains with the radical environmentalists, the pro-abortion people, that’s why Numbers is called Numbers. They’re just worried about the number of people, they think it’s bad when you have a child, they think you’ve done something bad to the country. They would be happy with a million more abortions, or a million more car accidents or a million fewer immigrants. They really do view people like Malthus did, but the economist was wrong and these folks look at Paul Ehrlich, the zero population guy, who told us that more people and we would all starve to death, but what they forgot is that more people more solutions, more people more good ideas, more people more job creating businesses. And those left of center groups have come inside the anti-environmental movement and some of them have pretended to be conservatives. Their arguments are not Ronald Reagan, Jack Kemp conservatism, their reasoning isn’t, and their goals aren’t. Which is why they don’t mind having loud anti-Hispanic, anti-Asian voices associated with the right is devastating politically in the Republican Party because they don’t care about the Republican party because they are not Republicans." Norquist concluded the interview stating, "We need to remind those people who think that somehow speaking ill against immigration is a conservative position, not it’s not. Ronald Reagan, Jack Kemp, and in today’s world, both President Bush’s, and successful governors Bobby Jindal and Governor Walker of Wisconsin, Perry of Texas, are all open and immigrant friendly folks and have recommended policies that yes secure the border, but if you’re going to have walls you want to have large doors." In the last year, Houston's popluation grew by more than 170,000 new people who immigrated to Texas from other states lacking the opportunities we have in Texas. Did our soup kitchens grow? Did our unemployment rolls grow? No, they did not. Instead we are building new skyscrapers to host new companies. We are building new homes to house these new residents. We are creating more jobs and more opportunity. 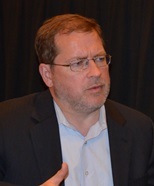 Grover Norquist has agreed to become a writer for TexasGOPVote. Watch for more articles and information very soon. 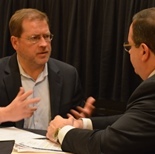 Following is a transcript of the entire interview we conducted with Norquist. We look forward to his input in the future. Bob Price: This morning we have the opportunity to sit down with Grover Norquist with the Americans for Tax Reform. Grover, welcome to Texas and thank you for talking to the readers of TexasGOPVote. Grover Norquist: Yeah, good to be here. Bob Price: Recently, like in the last two weeks, you spoke before Congress about immigration reform and in your opening statement you say that people are an asset not a liability. What does that mean really in terms of the immigration debate? Grover Norquist: Well, the debate on immigration is about would more people, would more Americans, be a good idea or a bad idea. There are some who say we should not have more immigrants, and there really is an argument about how many immigrants we should have. Anti-immigrant groups want either no immigrants or almost no immigrants. So when they say they’re for legal, but not illegal immigration when you ask about legal, they’re not for increasing legal, they’re for decreasing legal immigration. So at the end of the day they’re against immigrants, they want fewer Americans and fewer people. But what built this country, and it’s not just something people say to make us feel good about the Statue of Liberty, it’s that 70 million people came over from Europe and three quarters of them came to the United States in all of the Americas, North and South, three quarter came here. Very distinctive people come to a land of opportunity, people who want opportunity, and when they showed up they were poor, they were diseased, and they didn’t speak English. Within a generation or two they were just doing amazing things. So one of the questions you hear people is well if people come here they’ll be a burden and not an asset. The labor unions believe more people coming into the United States will reduce wages. Well when we had three million people in the country, we were pretty poor. We have 300 million, 100 times as many people, and we are much richer. Why, because people are an asset. They are not a liability, Malthus was wrong, the zero population growth people are wrong. They just think if another baby is born, oh no, we have to divide the pie with one more kid. Bob Price: And they only have a 10-inch pie basically. Grover Norquist: Yes the pie doesn’t get bigger, and babies never grow up and create Apple computers, when in fact they do. And immigrants do more of that stuff than people that are born here. There is actually fascinating new analysis of IQ that says the act of immigrating raises your IQ. I don’t know, bright lights, big city, new language stimulates everything and makes you smarter. Bob Price: Now Senator Rubio and the other senators have come out with a plan that many are calling amnesty. I think that’s a great abuse of the word amnesty and maybe we had this debate in English and actually used the definitions of words instead of just trying to shut people up by screaming the word amnesty, we could have a meaningful discussion on this. But tell us a little bit about the plan and why it is not amnesty. Grover Norquist: The plan says first of all we need to get control of the border. We have to have more security there. So they spend 4 or 5 billion dollars working on those areas, and one of them is to get some cell phone antennas, satellites, on the borders so that people in very rural areas can connect to the police. Someone got killed a number of years ago because they couldn’t connect to the police. The critics of Rubio’s bill ran out and said they were Obama phones that they were funding. Mocking the death of a rancher in order to score political points against securing the border suggests the lack of seriousness that we’re dealing with on the critics. I don’t mean the ones who want to amend, I’m for amending the Gang of Eight’s bill, Rubio is for amending. We’re open to, first of all, border security, second of all, taking 10 or so million people who are here and allowing them earn legal status. Now they’re treated, if you are arrested, you are not here legally, you don’t have papers, you have to leave the country and you have to wait ten years before you can apply for a green card again. That’s your punishment, a ten year timeout, and in a lifetime, ten years is a long time. Everybody that is here who wants to earn legal status has a ten year time out as if they were arrested. And then, if you were work the whole time, and you make enough money not to be poor, and you prove that you are not going to be a worry of the state, and you get no welfare or benefits during that 10 year period, then you can apply for a green card which in 3-5 years, maybe you get to be a citizen. Bob Price: So basically it puts you behind the line of all the people who are in the line now. Grover Norquist: Yes, exactly. All of the things that were legitimate concerns that were brought up in the past that people had had, this bill deals with that. That’s why when the critics of previous bills used the same argument, “this is amnesty,” for something that fixes all the things they claimed to care about, solves all the problems, they say here are my three concerns, we’ll do the border, you go the end of the line with the ten year timeout with no welfare benefits during that entire period until you’re a citizen. Then it talks about future flux. What do we about…we need more high tech people. There are people living in Canada working for Microsoft because they can’t get to the United States. There are people in India and Russia and China who wanted to work here who start companies in other countries. Bob Price: So they could be here in the United States paying taxes, hiring people, buying homes, hiring American citizens, and creating work here. Grover Norquist: You want to wine about outsourcing, but then you don’t let into the country the people to whom stuff is outsourced to and we need people to come work on ranches, there’s temporary work, there’s seasonal work that a guest worker program would be very helpful for. So there’s three things, how do you deal with high tech guys, guest worker programs, and make them significantly larger so that they can deal with what the economy needs, what we all need. And then border security, and earned legalization for the people who are here. If you have a felony or if you’ve broken the law, you’re kicked out, but we know in terms of security who’s in the country. We’ll have ID’s and we’ll know when they’re here and we’ll know when they leave. It’ll have to be much more secure to do this. Grover Norquist: Everyone is going to pay a fine if you stay, so calling it amnesty, someone who calls it amnesty hasn’t read the bill, they don’t know what they’re talking about, or they’re fibbing. I hear it from some of the professional anti-immigrant people, so you know they’re lying, they’re not ignorant of what’s going on they’re just lying. They use it the way a 12 or 13 year old uses a new swear word they just learned, because it gets such a rise out of everyone, but at some point you’re too old for that, and at some point it’s not funny anymore and you just turn it off. Bob Price: I think they use it the way the left uses the word racist, just as a tool to shut you up, because they think you will be intimidated by the use of the word. “Oh it’s amnesty, we can’t talk about it.” The last time I looked if someone was paying a significant fine for basically what amounts to a misdemeanor offense, it actually being present illegally in the United States is not even a criminal offense, it’s just a civil violation. You pay a significant fine, and you’ll serve anywhere from 10-13 years on probation and that’s amnesty? And at any point in time you mess up in there, you can be deported. Grover Norquist: The critics treat these people as if they were assets, these people are working, and these people are working everyday. When I go to work on Saturdays that’s who I see in and around the office buildings. They have a tremendous work effort and a tremendous attitude. And the other thing is that every immigrant group in this country from when the Germans started sneaking into Pennsylvania in the 1600’s was criticized with all the same rhetoric that you’re now seeing with these Asians and Hispanics. Bob Price: You mentioned earlier the professional anti-immigration groups. I would like to go more specifically into who those groups are, groups like Fair, NumbersUSA, and The Center for Immigration Studies. These groups have a very leftist background when you look at what’s behind them. What can you tell our readers about those groups? Grover Norquist: Sure, well not only were they created by men and women of the left who are from the pro-abortion, zero population growth, radical environmentalist worldview. Their arguments today is still the same arguments, they don’t use conservative arguments, they take the labor union argument, that more people mean wages go down, not that more stuff would be created. They take the radical environmentalist position that total numbers of people are bad things, that people are like pests, instead of created in the image of God, to create more things and people. They treat numbers, Center for Immigration Studies and Fair, each of these were set up as the other one got sort of outed for what it was, they set up some other group, but the control remains with the radical environmentalists, the pro-abortion people, that’s why Numbers is called Numbers. They’re just worried about the number of people, they think it’s bad when you have a child, they think you’ve done something bad to the country. They would be happy with a million more abortions, or a million more car accidents or a million fewer immigrants. They really do view people like Malthus did, but the economist was wrong and these folks look at Paul Ehrlich, the zero population guy, who told us that more people and we would all starve to death, but what they forgot is that more people more solutions, more people more good ideas, more people more job creating businesses. And those left of center groups have come inside the anti-environmental movement and some of them have pretended to be conservatives. Their arguments are not Ronald Reagan, Jack Kemp conservatism, their reasoning isn’t, and their goals aren’t. Which is why they don’t mind having loud anti-Hispanic, anti-Asian voices associated with the right is devastating politically in the Republican Party because they don’t care about the Republican party because they are not Republicans. They are happy if the left wins, the left really does want to shut down economic growth, and have lots of abortions and have fewer people. The 2007 immigration reform packets that president Bush put together was killed by a poison pill amendment that would of ended guest worker programs, introduced by Barack Obama. Organized labor remains the group most determined to kill this, the phony, the anti-immigrant groups pretending to be conservative do all the talking, but they don’t pull any strings. Bob Price: Now professor Stephen Steinlight with the Center of Immigration Studies, he came to Houston a few months ago, and we videotaped his presentation to a local group and his focus was on Mexicans. It wasn’t on Hispanics, or on the Asians, it was on Mexicans. Mexicans are lazy, Mexicans are not entrepreneurial, Mexicans are a burden to our society, these kinds of quotes that he is coming out with that it seemed really odd for someone with his background to be saying something like that. Grover Norquist: It’s sad, it’s widely inappropriate, and it’s un-American. All we can say, is people said the same things about the Chinese when they came over to work on railroads, they said the same thing about the Japanese, when they came over to join our country, the Koreans, they certainly said it about the Irish, horrible things were said about Irish Americans. I wish there were more Irish Americans that would of came over years ago, the Italian Americans, the Eastern European Jews, they said they had low IQ’s. His rhetoric against Mexicans has been said about every immigrant group in the country. There isn’t any immigrant group in the country people said “yeah, I’m so glad they’re here.” It’s sort of like being in a club and someone goes “we don’t want anyone else in our club.” Even with that constant reframe, the common sense of the American people over road some of the nativist tones that had been there from the know nothings and other groups, pretty icky groups. We’re the most powerful, richest, forward-looking nation in the world, because we’re the most immigrant friendly. Those two go together, Japan is not the future, because they don’t do immigration. They can’t grow, they can never have an understanding of the world, or be a player in the world and be seen as anything other than just about them. And they don’t have enough Japanese to be in the weight class to be a major player or to defend themselves. We have to defend them from getting eaten by their neighbors. China got fooled by the one child rule, somehow our radical environmentalist convinced them it was a smart idea. I think it was a CIA plot myself, but China is actually going to be declining in number of people in China. It is going to get old before it gets rich, they’re not going to have enough workers to take care of all the retired old people. Europe is… I wouldn’t say gone, but they’re declining in overall numbers. They’re not having enough babies, and they don’t do immigration well. We do immigration very well in this country, despite the unpleasant voices, better than any other country in the world and we have been for 200 years and that’s what made us strong. And look back to every immigrant group that people said like that guy Steinlight said about Mexicans. Those were all said about every group that came in and they were always wrong. Bob Price: You concluded your testimony at the Senate hearing saying you’ve “spoken of the shining city all my political life, but I don't know if I ever quite communicated what I saw, that it was a tall, proud city built on rocks stronger than oceans, wind-swept, God-blessed, and teeming with people of all kinds living in harmony and peace, a city with free ports that hummed with commerce and creativity.” I think that just encapsulates everything that makes this country great. When you look at Houston right now, Houston is growing; we had 170,000 new people here. It didn’t increase our soup kitchens, it didn’t increase our welfare rolls. We are building new skyscrapers, we’re building new homes, and we’re having a good economy because of those new people moving here. Grover Norquist: Absolutely, and that’s Ronald Reagan’s Quote, and we need to remind those people who think that somehow speaking ill against immigration is a conservative position, not it’s not. Ronald Reagan, Jack Kemp and in today’s world, both President Bush’s, and successful governors Bobby Jindal and Governor Walker of Wisconsin, Perry of Texas, are all open and immigrant friendly folks and have recommended policies that yes secure the border, but if you’re going to have walls you want to have large doors. Bob Price: Well thank you again for taking the time to talk to TexasGOPVote, we appreciate the access and hope to come see you in Washington at one of your Wednesday morning meetings. 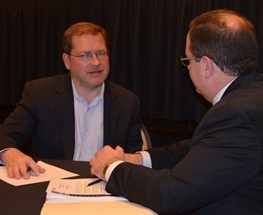 Grover Norquist: Do, I’m looking forward to it! Bob Price: I think they call that the grand central station of conservatism! Grover Norquist: Haha, we try. Bob Price: Thank you very much.